SendBlaster has always been a powerful tool for email marketers, and the new version 3 makes it even more powerful. This new version includes dozens of useful features you have come to expect from a professional email marketing software, along with the ability to export finished messages as HTML. Save as, to save the message as an eml file. EML is a standard format used by most email clients. Save as template, to save email messages as templates – making crafting future messages that much easier. The new version of SendBlaster keeps those three options and adds an exciting fourth option. Users now have the ability to export the message as HTML. That means that SendBlaster 3 is able to export the HTML code AND the embedded images in a ready-to-upload structure. This new feature makes it easy to publish a copy of your message to your website. We are sure that email marketers everywhere will agree that this is a very useful and valuable service. Email marketing is all about time – getting the right message out to the right customers at the right time. This powerful new feature can reduce the amount of time you spend changing your message – giving you more time to craft it, test it and send it. This great new feature, available in both the FREE and PRO versions of SendBlaster 3, makes it easier than ever before to publish a copy of each email message on your website. Email marketing experts have long touted the benefits of including a link to the web version of the message in each email. This new feature helps automate that process and make it seamless. Including a link to the web version of your message means that all recipients, even those whose email clients block graphic content, will be able to see your message as you intended. With this new feature, you no longer have to rely on inconsistent email clients to get the word out. With a single click, you can export all your code, along with all your embedded images, to your website. Those images are instantly ready to upload, eliminating the need to manually edit the message. Creating a web version of your email message could not be easier. 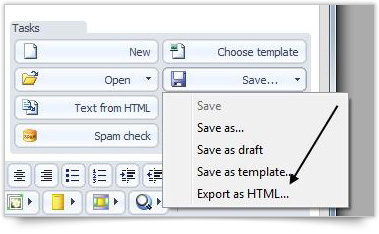 Just click on Save, then Export HTML in the Compose Panel editor. Just give your message a name and all of the coding and images will be exported. To continue, just select a directory for the online version of your message, then upload both the HTML file and the images folder (for example, using a FTP client like Filezilla). Be sure to upload both the images and the HTML file to the same directory. That is all you need to do. 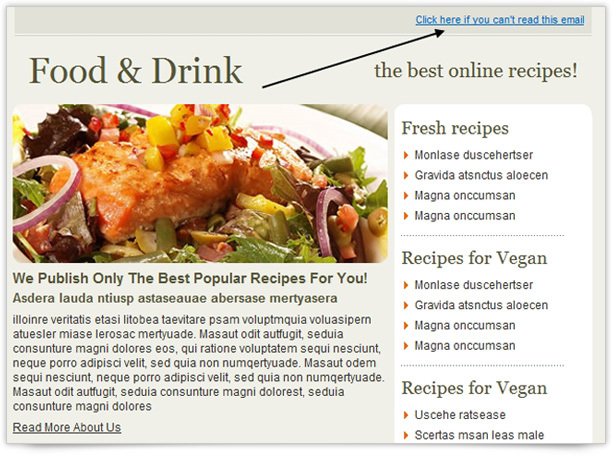 Your carefully crafted email message is now online and available for everyone to see at your website. All you need to do now is add the web link to your outgoing message and wait for the responses to start coming in. Since your message is now web-based, you can share and publish it anywhere you want. You can create an archive newsletter section for your website and use it to save all your old messages. You can promote your archived material in social media for more visibility…the possibilities are truly endless.